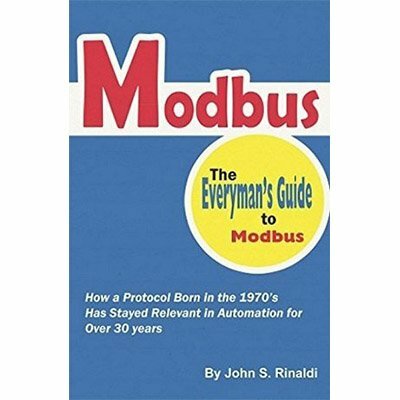 Modbus: The Everyman’s Guide to Modbus is well-written, well-organized, easy to follow and appreciate book. John Rinaldi is a true thought leader in the automation industry and recommend his writings to those we connect with in the automation. This book is a great resource for designers, engineers, and technicians in the automation field since Modbus is used throughout the world and understanding how to apply it is important for any person involved in the automation industry. John Rinaldi describes the Modbus communications protocol in easy to understand terms. The Modbus is used in a wide range of applications including industrial automation, process control, building automation, transportation, energy, and remote monitoring. Virtually any type of sensor and controller devices can be found that incorporates Modbus networking including programmable logic controllers (PLC), process controllers, process instruments, process sensors, PID controllers, motor drives, energy meters, Supervisory Control and Data Acquisition (SCADA) systems, programmable automation controllers (PAC), discrete sensors, valves, and many other embedded devices.